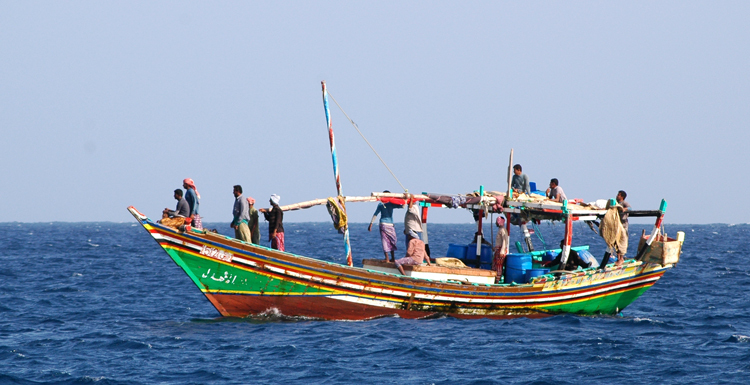 On our trip up the Red Sea, we often shared our anchorages with local fisherman. Like fishermen everywhere, they were full of waves and smiles. 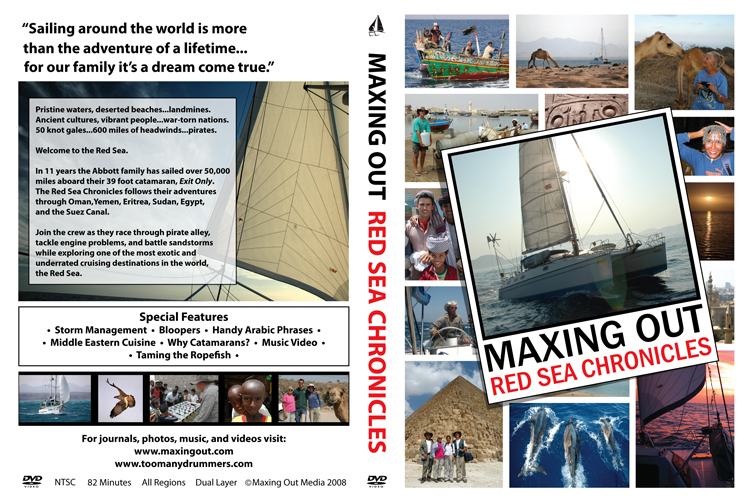 The life of a red sea fisherman borders on the arduous. They are totally exposed to the elements, and on many dhows, there's no protection from the sun except from their headgear and clothes. If the weather turns really nasty and the rain pours down, they'll probably pull out a blue plastic tarp to keep themselves dry. You can spot their toilet hanging over the port side on the stern - a poop deck of sorts. Those vertical timbers and wooden slats are all they have at their disposal when mother nature calls. They have the ocean to bathe in and a small stove on which to cook their meals. A single 75 horsepower Yamaha takes them to their destination, and a rusty rebar anchor keeps them safely moored at night. This dhow has a few additional luxuries not found on the most basic fishing boats. It has a small shelter in the back of the boat which gives fishermen shade from the burning sun. They also have a small sail that they can deploy when wind conditions are favorable in order to conserve fuel. Fourteen people live on this boat which stays out for weeks at a time. 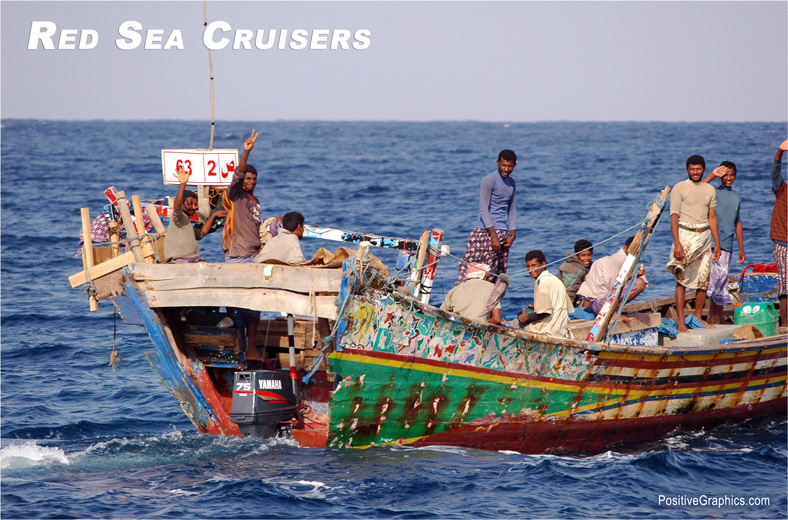 When the northerlies are blowing over twenty-five knots, the fishing boats anchor with us in the shelter of the islands and reefs that dot the western coast of the Red Sea. They use a homemade rebar coral pick anchor to hold their vessels into the wind. Fortunately, the winds don't often shift direction, and once their anchors are set, they have a secure refuge from the boisterous Red Sea wind tunnel. These small fishing boats have an insulated compartment amidships, and before they set off for a week of fishing in the Red Sea, they fill their homemade ice chests with large blocks of ice. The ice vendors drop the blocks of ice on a tarp, and the fishermen cut the large blocks into smaller chunks that fit into their ice compartments. Without the ice, the fishermen would have to return home every night with their catch. Fuel is too expensive for daily fishing trips, and ice makes it possible for these hardy fishermen to stay at sea for a week at a time. 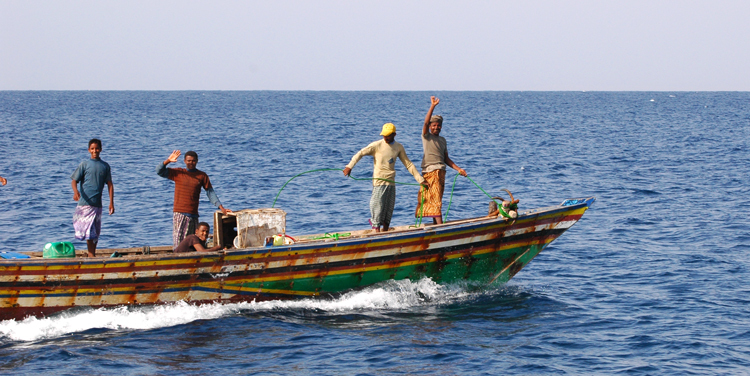 The Red Sea fishermen are a pleasant and happy lot. You don't need a million dollars to have a million dollar smile.